If you're in the market for a convertible with exceptional style, take a close look at the Ford Streetka, a soft-top with ultra-cute looks, a compact body that makes it ideal for city driving, plus a responsive drive. Low running costs also make this fun two-seater a great pick, and while storage space inside the vehicle is understandably limited, practicality is not the main reason for buying this model. 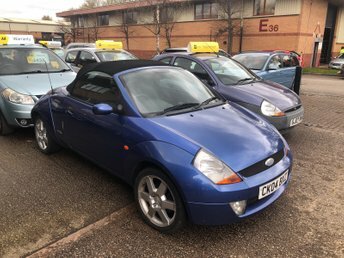 Come and take a closer look at the current range of used Ford Streetka models for sale in Flint at Flintshire Car Sales by paying us a visit in person. Alternatively start your search here on the website and contact a member of the team for more information.